You’ve been inundated with such generosity and shiny new gifts it’s time to put pen to paper to express your gratitude. Don’t leave it too long, especially for the older generation - dedicate the time and tackle these in batches, as you’ll have quite a few to get through. Why not invite those have played a special role for a post-wedding get together, either individually or as an intimate group – make it a relaxed affair – no fuss just fun! You’ve spent a extraordinary amount of time, money & effort to have the perfectly fitted wedding dress – it's only right that you give it a bit of TLC before putting it away. Research this one carefully! It's best to opt for recommended cleaning specialists over price or convenience. • Do they clean dresses individually or in large machine batches? • How will they protect the little intricate areas of your dress such as beads or lace? • How will they pre-treat stains? • Do they have any testimonials or examples? If you’re on a tight budget you may want to go for the DIY option – but approach with great caution and understanding of both your dress's materials, associated cleaning methods and your own skills! Take a look at this useful tutorial here on how to do it. Mood boards, samples, quotes, budgets & your cereal box makeshift table plan– it’s time to release yourself from wedmin mania. Make a pledge to yourself to tackle your pre-wedding preparation area and hit it with gusto! Head to the overflowing planning file/box/area or even room (you know who you are) and be ruthless. Where are you going to put those shiny new gifts? You’ve taken the decisions and the big day was wonderful! Just keep the mementos and things that you really cherish – you may need to dig deep and part with all of these beauties but come on, you know it needs to be done! So you’ve got your marriage certificate and everything just changes to Mrs X by magic, right? Afraid not. There’s a whole bunch of people that you need to notify of your change in name ranging from government bodies (DVLA, HMRC, Passport) to finances, utilities, insurance and social media accounts. This can be a painful and drawn out task with varying processes, forms and requirements to navigate. • Do your research. Get together a list of all the companies you need to notify of your name change and research their processes and supporting documentation required. • Get copies. 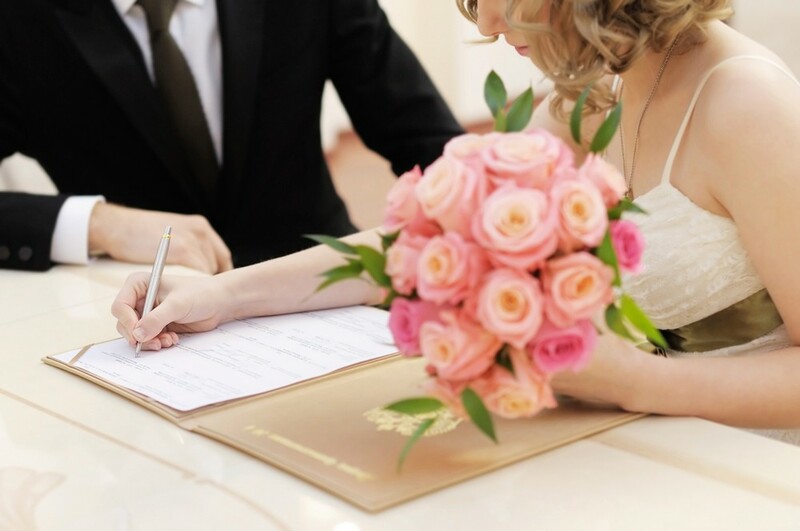 Some companies accept copies of marriage certificates which means you can get multiple switching going on in parallel. We recommend having 2-3 copies available. • Invest in stamps and envelopes. Some companies will accept electronic submissions but the vast majority are still old school and need to see original copies. As a general rule of thumb, we recommend you include a SAE (A5, large stamp) to enable speedy return of your documentation. Original certificates are really quite precious, so consider recorded delivery if you want extra assurance. • Plan it out. Think of lead times, travel or important events to plan out so you can work out what to initiate and when – prioritise photo ID (driving license and passport). Keep a note of your sent/notified date and return due dates to keep you on track. • Set yourself a target. It’s not possible to update your name everywhere in an instant, but you don’t want it to drag on through the seasons either. Set yourself a realistic goal to work through your list. That’s right, have a guilt free weekend where you have no to do lists – just chill out and be a regular couple (remember, you used to do this)! No tasting, no choosing, no wedmin, no debate, no-rearranging, no collecting…. just go with the flow, guilt & schedule free – enjoy spontaneity and just be! There is one thing you should schedule though…. Date Night! Yes we know it sounds cheesy but it actually works and it’s an important element of maintaining a healthy relationship. Life & work can be all encompassing. Regular date nights curb the risk of getting complacent in a marriage and who doesn’t love a little butterflies and buzz of getting dressed up for a special night out? The Guardian has a great article on how date nights are a great discipline for your marriage and it is well worth the read! Your First Wedding Dress Appointment!